Do you have a blog/website where you are selling products relating to your site content? If so, then read through this article and it will be worth your while! As we discussed briefly in a previous post, one the many ways to earn money from your blog/website is by affiliate programs. This time, we shall look upon that in more detail. By way of an example, we shall look at Amazon Associate program. 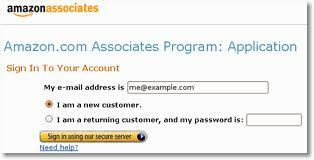 Amazon Associate program is one of the biggest affiliate programs you can sign up for. And is also one of the best, since amazon.com sells a wide range of products, as you all may well know. So what is this affiliate program thingy? Well, it’s simple really. You sign up with a service, you advertise their products on your website and they pay you a portion of every sale made through your website! And the more products of theirs you are able to sell through your website, the greater portion you receive. Amazon is one such service and they pay you handsomely enough! What sort of products can I sell? Well, that depends solely upon your website’s content. Even if you were not planning to sell anything before, you can start now! You can advertise any product that relates to your website’s content. For example, if you have a music related website, you can advertise popular songs and albums (CDs/DVDs or MP3 downloads) on it. If you have a literary website, you can publicize top novels and books. Similarly, you can promote certain fitness products like exercise machines etc if your website is about personal fitness tips or similar. Well, you get the point (I hope). You can find almost any type of products at Amazon, thanks to the fact that they are such a big service! 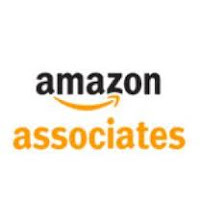 How do I apply for Amazon Associates? Well, that’s an easy one. Once you have decided what you want to advertise on your site, the next step would be to tell Amazon that you are advertising them! Go to the monetize section of your blog and select Amazon associates for the sub-tabs there. Or you can go directly to their sign-in/up page, https://affiliate-program.amazon.com. You have to provide your basic information over there like address, telephone numbers etc (enter your primary address in the address link 2 bar, not address link 1). Then, give them the URL of your website and tell them what it is about and what you plan to advertise. This, I think, is a very important part of the applying process, because whatever you write, it will serve as a first impression. So do this carefully, but try not to be over smart. First, just describe what your website is about in no more than two or three sentences. Then write who this website is for or what sort of audience are you targeting. Again this shouldn’t be more than a couple of sentences. Then tell them how your audience interacts with you. For example, you can write that you provide your audience with the latest information on a topic and they provide their feedback and make suggestions, etc. Lastly, tell them what you intend to sell. For example, if you have a music site, you can tell them that you intend to advertise music albums that can be found on amazon.com. And that’s about it! The rest of the form shall be easy enough. How to increase my chances of being approved? With that being said, let’s talk about how to improve your website so as to make it “Amazon-friendly”, or in other words, increase its chances of being approved by Amazon. The Amazon associates team will take around three to four days to process your request. They will visit your website during that time. So you can make some changes discussed below during that time, or before that. Frankly speaking, Amazon do not care much about the contents of your website (unlike Google AdSense), so long as you do not violate their terms (sexually explicit content etc). All you have to do is to advertise their products thoroughly. Meaning that the links you put on your website need to be clear and the viewer should be able to see them at a glance. Subdued links at the bottom of your page will not help at all. Another thing you can do is offer different versions/formats/purchase options for your products, for e.g. giving links to MP3 version of an album as well as its CD/DVD link so viewers know what options are available for them. Also write prices next to the products so they are noticeable at the first glance. Another trick is to add product previews to your links. Product previews are previews, powered by Amazon, that appear when you hover over a product link. They provide general information about the product like its picture, price etc. They are quite attractive and give your website a professional look. Visit https://affiliate-program.amazon.com/gp/associates/tips/t8 to get more information on product previews and how to add them to your website. If you are having difficulty, just send us an email and we will be happy to help. One more thing! Add as many Amazon widgets and banners to your site as you can. Don’t worry. You won’t have to keep them forever. At least keep them on your site while it is being inspected by the Amazon team. You can remove some or all of them after you have been accepted, that is, if you don’t like them (if you have been rejected, you might need to keep them for the next time you re-apply J). You easily can add banners and widgets to your site. Amazon helps you a lot on that score. They provide you the code and you just have to paste the code on your site! It’s really as simple as that! Again, if you are having trouble, we’ll be obliged to help. How and what amount am I paid? Well, as we said at the start of this article, you get paid for every sale made through your website. The portion you get depends on the number of sales you get, and the more sales you get, the greater your portion is. The great thing about this process is that, you just sign-up for free! Just like Google AdSense, you don’t have to pay a penny to Amazon for signing-up! And they pay you in return! Could it be easier than that? The portion you get is around 4% at the start but you can get up to 15% share on each product sale! Another awesome thing about this program is that, they pay you by cheque. Just like Google AdSense. You don’t have to have a bank account to receive the cash. Although you can opt for bank deposit option, it’s not mandatory. You can set any limit above the minimum allowed ($100) and when your balance reaches that amount, the Amazon people send a cheque in your name (or anyone else’s if you have defined them) to the address that you provide them at the time of your sighing-up.